For the last three years I have gone to Cottage Grove, Oregon to do the Rolf Prima Tri at the Grove. It is a fun, low key and grass roots type event held in a beautiful location. 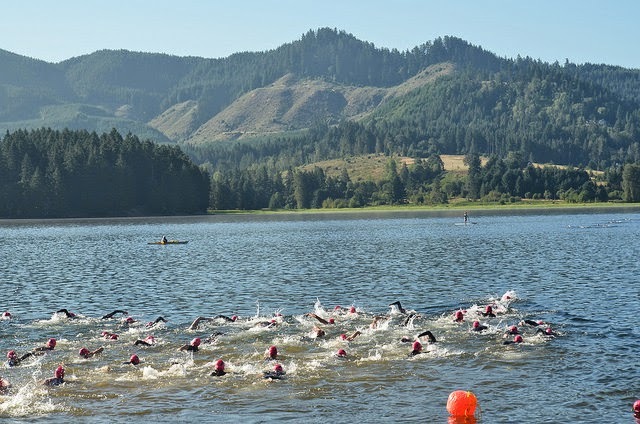 Race day has you parking close to transition and hopping into a warm and calm lake for the swim, riding amongst the evergreens and winding along the lake for the ride and running next to the lake for an out and back run. Nothing is too crowded, everything is accessible and you can really focus on having a great experience whether it is your first triathlon or one of many you have raced. The Pro panel before the race. We offer tips, answer questions and share our past experiences. We talked about transitions and how to keep it simple. The swim start for the Olympic distance race. There is a sprint distance as well that goes off first. Buoys are plentiful and sighting is stress free with the calm water. My new Roka goggles were great for the sunny morning. We started at 8:31am. A perfect start time; not too early and not too late. Finishing up the swim. Tip–make sure your PowerGel stays in your pocket when you pull your wetsuit on. I was looking for that gel during the run. Heading back to transition after the bike. It is mostly flat with just a few rollers. The run is flat along the lake. It offers shade and some sunnier sections. There are blackberry bushes along the course as well. I did not stop to grab any although they would have been yummy. Kate Bevilaqua and I have gone back and forth the past couple of years. It seems that I win in even years (12′ and 14′) and she has taken the odd years. We will see what happens next year! I jumped back in the car after the race and headed back up to Portland for some time with family. That is the only reason I have the compression socks on—for the drive!